The information presented on this page was originally released on November 15, 2007. It may not be outdated, but please search our site for more current information. If you plan to quote or reference this information in a publication, please check with the Extension specialist or author before proceeding. Once again I am surprised by the fall leaf color, especially after the drought across so much of the region. Native hickories are showing outstanding golden orange color, but the stalwart performer in many landscapes is the Autumn Blaze red maple. Autumn Blaze is a maple that has received numerous accolades in the United States. First, the Iowa Nursery and Landscape Association chose it as its 1997 Tree of the Year. Then to show you its true versatility, in 2003 it was selected as a Mississippi Medallion award winner. In 2004 Autumn Blaze received what may be its most prestigious award, the Urban Tree of the Year from the Society of Municipal Arborists. One reason is its adaptability. Autumn Blaze performs from the extreme cold of zone 3 in Wisconsin to the warm, humid South. It is a rapid grower, eventually reaching 50 feet tall and 40 feet wide. Fast growing is not normally a trait we horticulturists like in trees. Most rapid growers are the first to succumb to disease or insect pressure and weather failures. Autumn Blaze red maple is known botanically as Acer x freemanii. It is a hybrid of the native red maple (Acer rubrum) and the silver maple (Acer saccharainum), combining the best features of both. 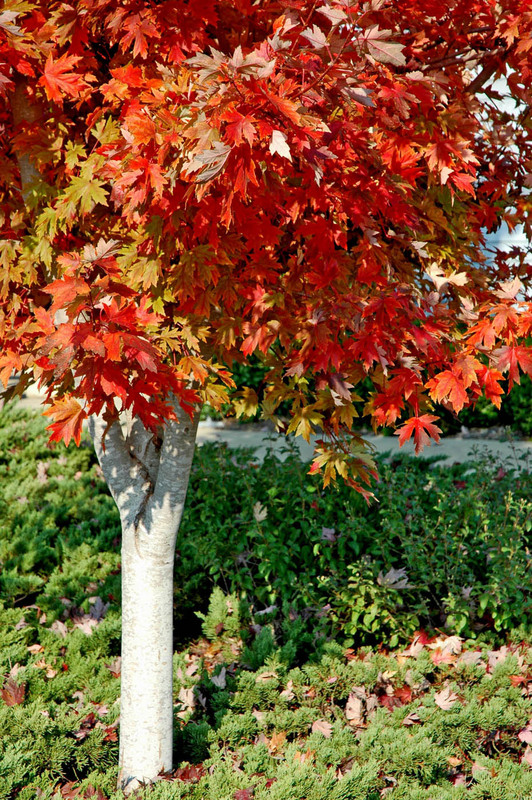 From red maples, Autumn Blaze inherited its fall color and a well-balanced branching habit. 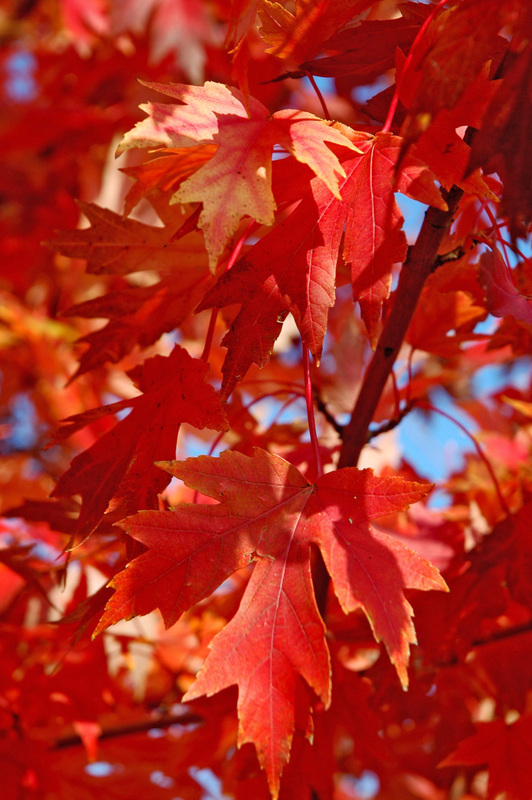 Silver maples contributed an increased tolerance to drought and poor soil conditions. Autumn Blaze can grow in some tough sites, such as areas with high clay soils, and wet or dry sites. The leaves are a medium- to deep-green in summer, developing into a brilliant, long-lasting, fiery orange in the fall. They resemble the five-lobed and deeply cut silver maple leaves. The bark is also reminiscent of the silver maple -- smooth and light colored in the first years and then becoming furrowed with dark ridges as it ages. Autumn Blaze has another outstanding trait in that it is nearly seedless, which means there is no mess or unwanted seedlings to clean up. Fall is a terrific time to plant in the South. Even though top growth has ceased, the roots will grow and become established in your landscape before the onslaught of next summer's heat. Plant them in full sun with well-drained, moist, fertile soil. Place the top of the root ball even with the top of the soil in a hole dug three to five times as wide as the root ball but no deeper. When planting in midsummer, form a 4-inch berm outside the root-ball area that can hold 5 gallons of water. Water deeply and apply mulch, and remove the berm after the first year. Autumn Blaze excels as a stand-alone specimen, but the truly outstanding displays are made when tall conifers are used to create a green curtain as a backdrop making the fiery orange even more spectacular.